A fantastic gift for any new mom and her twin boys! 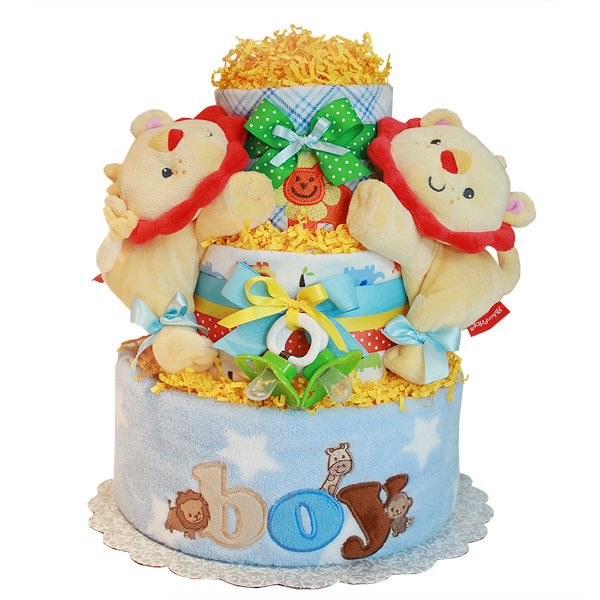 Beautiful handmade three tiers Fun Two Lions Diaper Cake is ideal for a twins/jungle themed baby shower! Colorful and fun design! It can be used as a shower centerpiece or just to give as a gift. This cake is created with 45-50 Huggies Snug&Dry diapers size 1 (7-14 lbs. ); two flannel receiving blankets 100% cotton with jungle theme; one soft blanket; two pacifiers; two JOHNSON'S Baby Powders Pure Cornstarch with Aloe Vera & Vitamin E (Gently absorbs excess wetness to keep skin dry and soft) 1 1/2 oz; two teethers; two bodysuits; two lion toys; ribbons and bows. The diapers are held together by ribbons no glue on diapers. Decorated with pins, ribbons, bows and crinkle paper. This cake sits on a 12" corrugated cake board and 14" high. Comes wrapped in cellophane with coordinating ribbons and bows. All our diaper cakes made of highest quality ingredients with greatest care and love. Everything included is ready to use and easy to disassemble. For all our diaper cakes we use the highest quality diapers. Usually diapers from size one to size two used to build our cakes. We handle all the diapers with care and in absolutely clean conditions. We take great care in sealing and packaging our cakes to insure that all cakes look great when delivered and all diapers are clean and ready to use. It is very easy to disassemble our cakes for actual use of all included items. All diaper cakes from Diapercakesmall.com are carefully packed and secured in high quality shipping boxes to ensure best possible look right out of the packaging. You should be able to enjoy all the beauty of our high quality diaper cakes right out of the box. We try to ship your order next business day. Our standard $5 flat shipping rate applies to all orders and we ship UPS Ground. Check our Shipping Policy page for estimated arrival date of your order. We want you to be absolutely thrilled with our diaper cakes. If you are not satisfied, we will exchange or refund your order. Our goal is to make baby showers memorable and original. We have great feedback from our clients. And we are looking forward to receive it from you too. Our detailed return policy.